I would like a side car for a vespa 150. Can you send me some information please? This is a question we get often, so it’s as good a topic as any to kick off a new series on ScooterFile: Frequently Asked Questions. In this series we’ll cover topics that come up often, but don’t necessarily have obvious answers. We’ll consult with experts and hopefully provide the final word on the topic. For today’s question, it’s a very straightforward answer: modern Vespas were not designed with sidecars in mind. This doesn’t mean that one couldn’t be attached, it simply means that in building all their scooters post-P-series, Vespa has not made design or manufacturing allowances for attaching a sidecar to their scooters. It doesn’t mean it can’t be done, but it does mean that there is no simple, bolt-on kit for attaching a sidecar like you’d find for vintage Vespas or the Genuine Stella. Yet anyone asking this question has probably seen photos like the one above. So what gives? 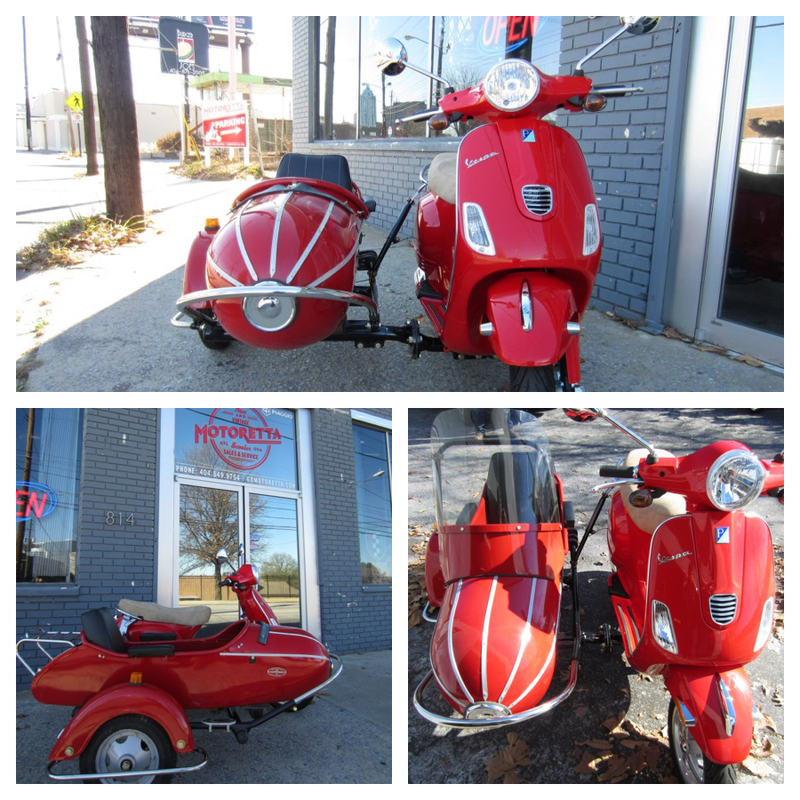 What gives is that this and other examples of modern Vespas with sidecars attached are 100% custom installations. The examples in these photos are actually a concept scooter Vespa did for EICMA a few years back. Like we said earlier, there’s purely no bolt-on option, but that wouldn’t stop someone with the engineering and fabrication skills from safely modifying a Vespa to accept a sidecar. The tricky bit is finding the right engineer/fabricator. There are a handful of places that make sidecar kits that can be made to fit a modern Vespa, but installation will require modifying the bike itself. So that’s the answer in the end, based on what we’ve been able to find. You can have a sidecar on your modern Vespa, but it’s going to take finding either a custom fabricator who can adapt an existing side car to your scooter, or working with someone like the companies mentioned above to do the installation of their kit for you. So it can be done, but unfortunately it’s not as straightforward as, for example, adding a side car to a Stella or Vespa PX. If you take the leap, please let us know. We’d love to see the results. Have a question for the ScooterFile staff? Have something you’d like us to research? Send an email to ask@scooterfile.com or use our contact form.